Honestly, I don't know much about pet food. Yes, we've run articles on Culinate about it, including an interview with pet-food expert Kymythy Schultze and an essay about making homemade dog food, not to mention taking note of nutritionist and food activist Marion Nestle's most recent book, Pet Food Politics, about the 2007 melamine-contamination scandal in pet food. But, frankly, I've always been a mainstream American pet owner: I buy bagged and canned food for my pets, and they eat it. Lately, though, I've started to feel guilty about the foodie double standard in our household. The humans? Well, the fridge and pantry in our house are stocked with plenty of local/organic/homegrown/holier-than-thou goodies. The cat and the chickens? Not so much. Let's take a look at what the cat eats (quite happily, I must say). Dry kibble is her standard fare; I buy her stuff with pseudo-virtuous labels like "natural," knowing full well that "natural" doesn't really mean anything, despite the USDA's recent attempts to define the term for meats. I buy it because the ingredients list is less creepy than the ingredients lists on the other bags of dry cat food, but I'm still not perfectly at ease with it. It's the wet food that really creeps me out. (And this glop, of course, is what our cat begs us for every evening, shunning the dry food until she gets a spoonful of goo.) For a buck, I can get three cans of processed meat product festooned with amusingly euphemistic names, like "Prime Fillets" (tripe and lungs, I think, judging by the look of the stuff), or "Mixed Grill," which makes me think our cat is sitting down to a platter of surf-and-turf at her local steakhouse. bq. 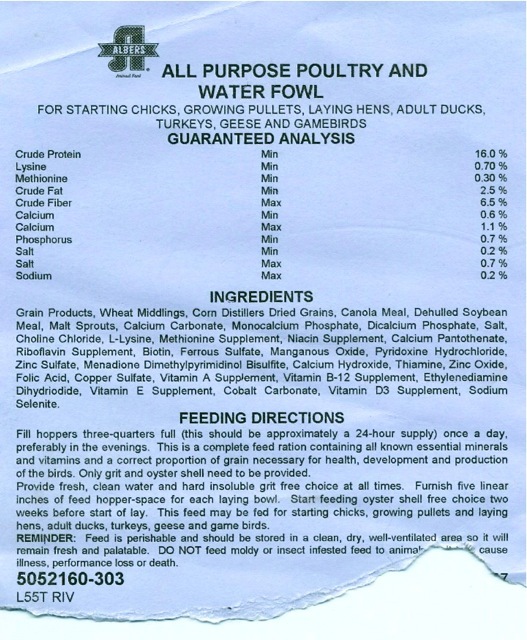 Meat by-products, poultry by-products, sufficient water for processing, turkey, poultry giblets, fish, guar gum, salt, titanium dioxide, carrageenan, potassium chloride, sodium tripolyphosphate, vitamins \[a long list follows here\], minerals \[yet another long list\], choline chloride, taurine. OK, so "by-products" always sounds a little scary. Cow bones? Chicken feathers? Who knows? But at least there really are turkey and giblets in the can. Titanium dioxide, however — well, you're probably more familiar with that as a prime ingredient in sunscreen, or if you paint, as the basis of the color known as titanium white. Yum. bq. I think the food should be varied, but the complete and balanced stuff is fine. The commercial companies go to a lot of trouble to make sure that complete and balanced really is; they work hard at it. I’m not coming out of this thinking that commercial foods are poison — unless they have melamine in them, of course. OK, so I guess I feel a little better — although the fact that our cat shuns fresh fish and meat scraps in our kitchen when offered in favor of the commercial stuff does make me wonder whether she's just addicted to junk. The same isn't true of our chickens, who happily eat both their chicken feed (disparagingly referred to around our house as "Monsanto Meal") along with anything else we throw their way, especially anything green or grub-like. Do our birds really need chicken feed, or would they get what they need if left to forage for themselves in our yard? Well, if we turned them loose every day, they'd certainly get plenty of greens and grubs and worms and grit (essential for chickens to eat to help grind up their food). But, frankly, as urban chicken owners, we can't do that; as it is, every time we let the chickens into our front yard to wander around, concerned passersby bang on our front door and yell, "Your chickens are on the loose!" Which means that the birds spend most of their time in their coop (slim pickings there) and in their run (totally stripped bare by the birds and the winter weather). If we didn't_ give them feed, and grit, and oyster shell (to ensure their eggshells are thick and firm), they'd starve. Yes, they eat kitchen scraps. But kitchen scraps alone probably aren't enough, in quantity or quality. Bruce Kollmann, CHS Nutrition's Pacific Northwest sales manager, assured me that yes, their Payback Poultry organic products really are certified organic, and that those mysterious "grain products" on the feed label are mostly sourced locally, in Oregon and Washington, and include corn, barley, wheat, peas, and flax. Well, whaddaya know. 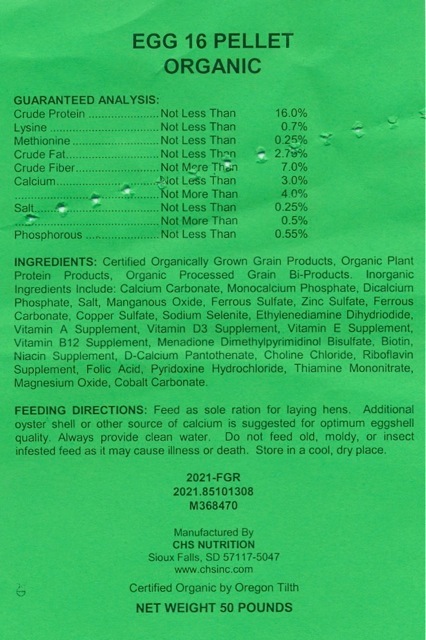 OK, so the organic feed includes some soybean meal, imported from — gasp! — China. But so far our chickens haven't shown any sign of melamine poisoning. 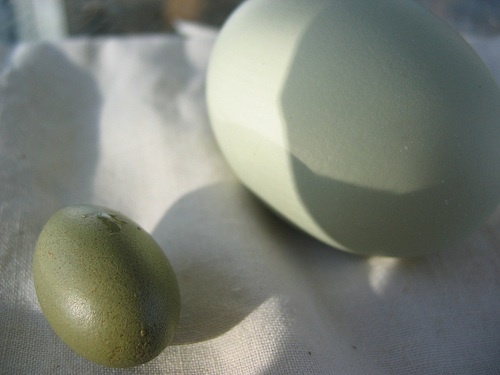 The crucial difference between our chickens and our cat, of course, is that we eventually eat what our chickens eat, in the form of the eggs they lay. And those eggs are still mighty tasty. Am I going to try to make my own chicken feed or cat food? Not likely. Am I still going to feel guilty about it? Probably. Am I going to worry about eating our chickens' eggs? Just a little. But the cat and the chickens seem pretty content.